Generally speaking, if an owner wants a yacht with maximum interior volume and comfort, he has to go with a round-bilge displacement hull, but he sacrifices speed. Conversely, if he wants to go faster, he would opt for a hard-chine, semi-displacement or planing hull, but he sacrifices volume and comfort. 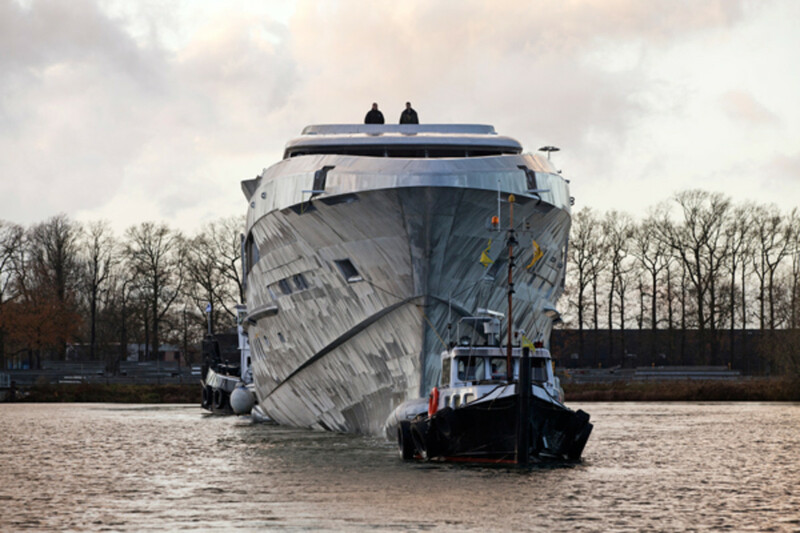 Galactica Star’s innovative hullform resolves this conundrum. Dutch naval architect Perry van Oossanen and his colleagues at the eponymous firm of naval architects founded by his father, Piet, made a bet among themselves that they could improve upon conventional displacement hulls to reduce resistance and increase efficiency across a broader speed spectrum. They succeeded in their efforts and the Fast Displacement Hull Form (FDHF) was born. Displacement hulls have evolved slowly since the bulbous bow was first discovered, rather than invented, at the end of the nineteenth century when towing tests with U.S. Navy warships established that the ram stem projecting below the waterline helped to decrease resistance. 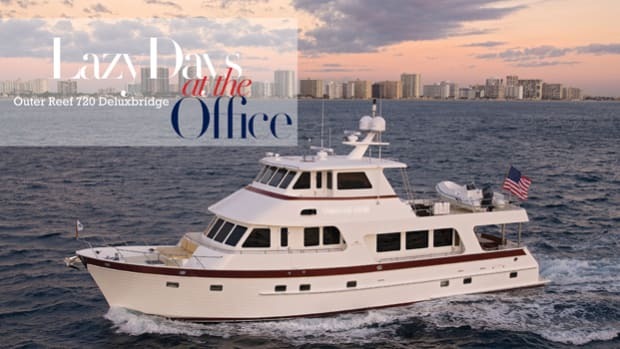 The solution behind the FDHF concept was to take a specific bulbous bow and combine it with a slender forebody and a shallow transom area that is barely submerged. In addition, a vertical metal plate or interceptor was added to the transom below the waterline to provide significant lift at the back of the boat and optimize its horizontal trim. An added advantage is that the shallow transom’s gently rising buttocks provide more room for bigger and more efficient propellers. Van Oossanen Naval Architects worked closely with the Heesen technical team to convert these characteristics into a buildable superyacht. The result is a unique hullform that combines the low-speed efficiency of a full-displacement motoryacht with the maximum speed associated with a semi-displacement vessel. Piet van Oossanen claims the FDHF out-performs conventional displacement hullforms at all speeds up to full planing speeds, while at semi-displacement speeds the resistance values are 15 to 20 percent better than those of hard-chine hullforms. This is significant because the typical operating profile of a superyacht consists of long-range cruising at low speeds and only short spells at higher or maximum speeds. 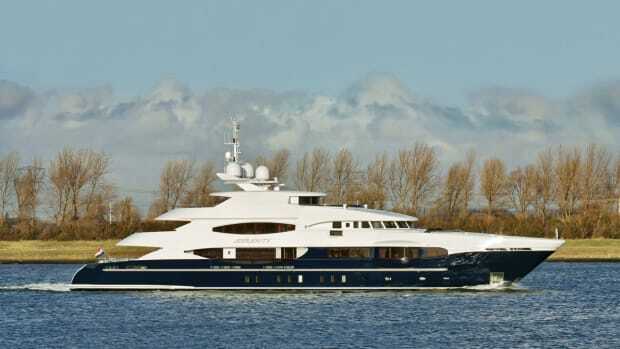 In fact, powered by twin MTU (5,600hp/4,300kW) main engines, Galactica Star has a top speed in excess of 27 knots, and a range of 4,200 nautical miles at 14. 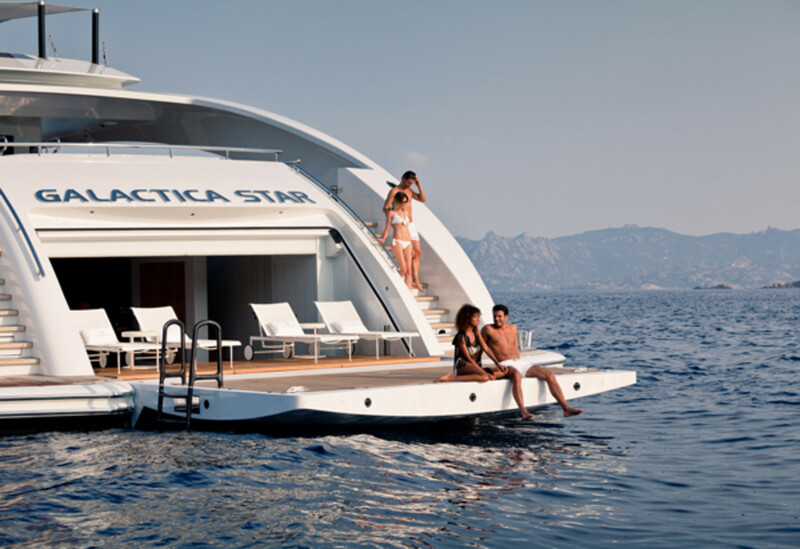 In a comparative study with other motoryachts of 60 to 70 meters (197 to 230 feet) launched after 2000, Galactica Star performs consistently at higher speeds with less propulsive power. From the owner’s point of view, this means lower fuel consumption and operational costs, while less bunker capacity frees up more space for other services or guest use and smaller engines help to reduce noise and vibration. Moreover, the customary “resistance hump” that affects hard-chine hulls in the transitional speed regime from displacement to semi-displacement mode is done away with. The hullform also dictated the use of five inboard Seakeeper gyro stabilizers, as opposed to exterior fins that are prone to damage, produce drag and require cutting through the hull. The advantage for owners and guests is that because the gyros are powered by electric motors and work in a vacuum, they are virtually silent, especially when the yacht is at anchor. 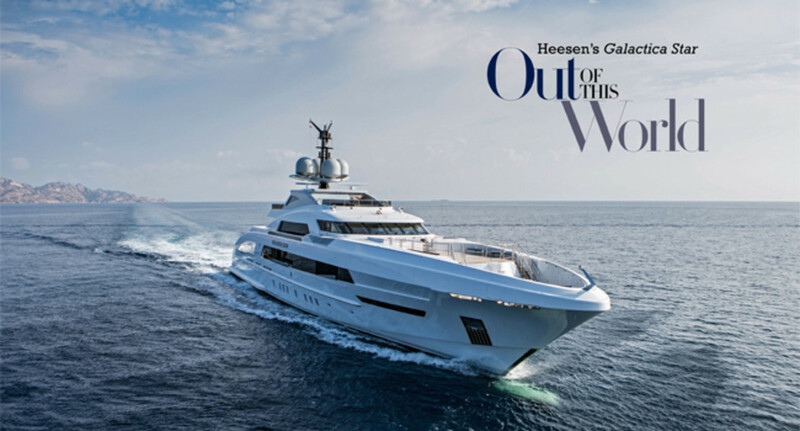 Galactica Star’s FDHF remains hidden from view below the waterline, so the team at Heesen Yachts turned to Frank Laupman of Omega Architects to develop an exterior profile that visibly reflected her innovative naval architecture. His early sketches already reveal a superstructure profile with very few overhangs that rises to an apex amidships, creating a balanced form that is underscored by windows with edges inclined toward the radar mast. Laupman likens its overall shape to a streamlined helmet similar to those used by speed cyclists. The gracefully curved arches or flying buttresses in the stern connecting the hull and superstructure initiate a line extending all the way to the tip of the bow and accentuate the length of the hull over the height of the superstructure. 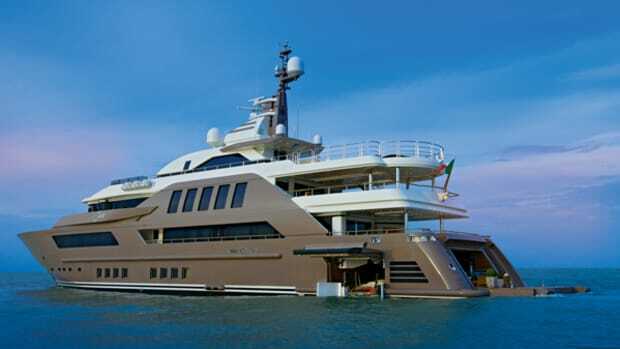 Attempts to contain the size of the superstructure, along with the slender forebody associated with the FDHF, means that Galactica Star is not as spacious inside as some widebody yachts of similar length, but this was anticipated from the start and the relatively small footprint of the superstructure means there is correspondingly more space available for outdoor living areas. The task of creating a similar signature style for the interior design fell to Dickie Bannenberg and Simon Rowell, the London-based duo who have earned a reputation for devising creative solutions that are daring in concept and sophisticated in execution. 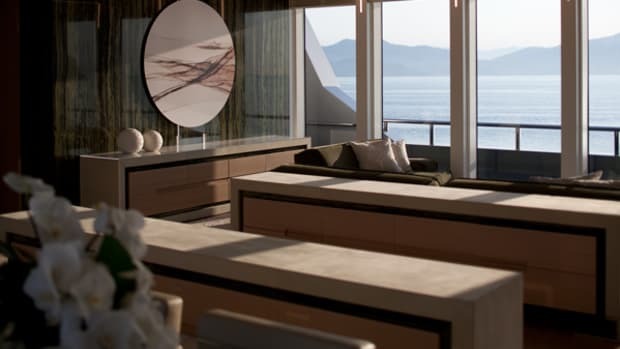 There are plenty of signature Bannenberg & Rowell motifs, such as their penchant for symmetry and geometric shapes, but aboard Galactica Star these elements have taken on a three-dimensional identity by being absorbed into the fitted furniture. Despite being complex in concept, the result appears surprisingly simple, which is arguably the secret behind all good design. 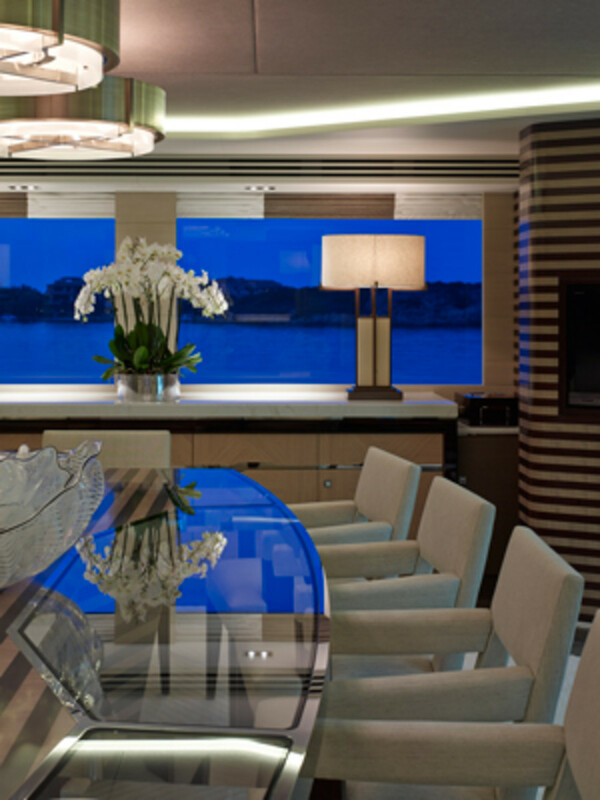 As the focal point on any superyacht, the main salon highlights many of these elements. The main salon is usually directly above the engine room and has to accommodate the large ventilation ducts on either side; these invariably impinge on the interior volume at some point by narrowing the available space, resulting in a featureless zone between the salon and the dining room. The said bar unit of white Carrara marble, glossy macassar ebony and backlit glass, is an imposing piece that illustrates how the three-dimensional quality of the interior design is reflected in the furniture itself. When viewed in the GA from above, together with the two armchairs in front of the fireplace opposite, its gentle radii and angled planes echo the hourglass shape of the floor and ceiling plan. 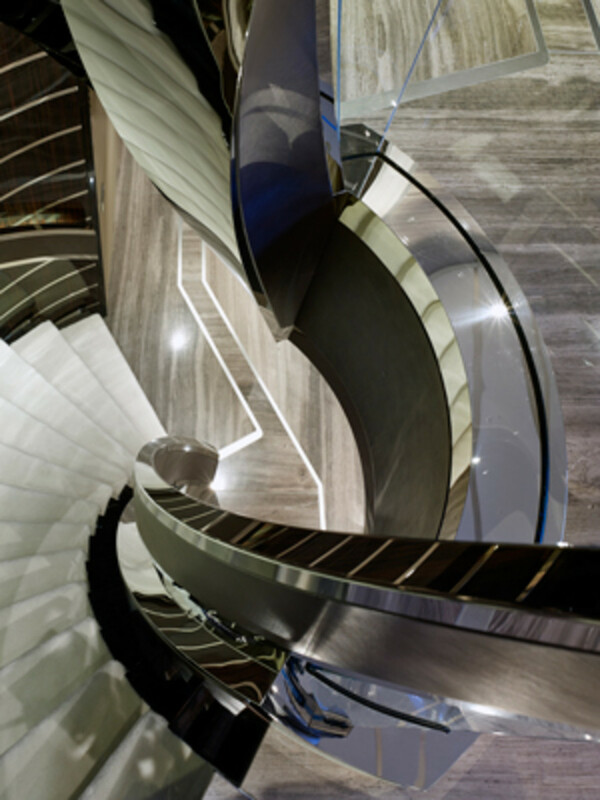 Bannenberg & Rowell selected the palette of materials and finishes to provide contrast in terms of tone and texture. It draws on precious hardwoods like ebony and wengé, but also soft timbers such as silver-oiled oak, rippled sycamore and brushed spruce. All these wood varieties appear in the main salon where the most striking contrast appears in the banded paneling of gray rippled sycamore and mid-toned wengé with a satin finish. Another prime space aboard Galactica Star is the beach club. By moving the tender garage forward into the bow, nearly 80 square meters (861 square feet) were freed up on the lower aft deck. Because these spaces are at water level and necessarily contained within the hull structure, providing the kind of natural light and easy access worthy of the “beach club” appellation can be a challenge. So in addition to the transom door that folds down to create a swim platform, there is another platform that does the same on the port side to maximize the floor plan. Moreover, the large pool on the main deck immediately above has a glass bottom, creating another source of natural light that is dappled blue by the water above. 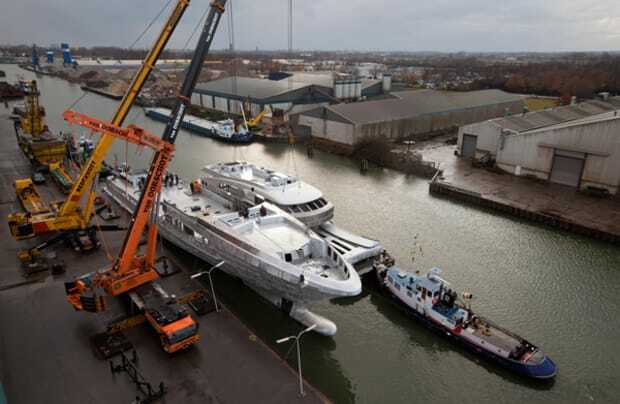 At 10 meters (32 feet 10 inches) longer than any other recent yacht launched by Heesen, the decision to build bigger was part and parcel of the evolution of the brand. “Our approach was to create something new with never-before-seen design features and technology, ” says Mark Cavendish, sales and marketing director at Heesen. Although the shipyard is an accomplished builder of fully custom and series yachts, the new hullform and overall size of the project presented challenges in terms of design and engineering that had to be resolved prior to cutting metal. 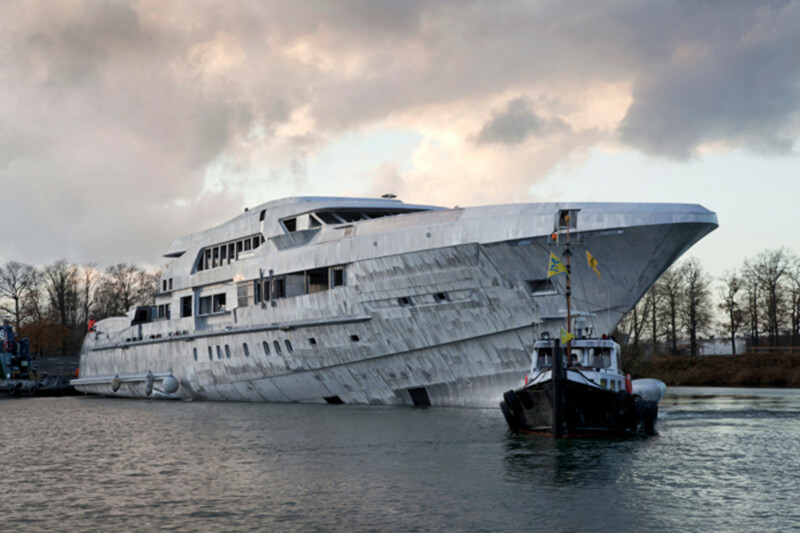 Galactica Star took less than 30 months to complete following the laying of the keel in early February 2011, well within the norm for a yacht of her size. But the design and development process began at least 18 months earlier in June 2009 with the initial conceptual study. The entire procedure from concept to completion took some four years. During sea trials in typical North Sea conditions with pounding seas and buffeting winds of Force 5-6, it quickly became evident that the contractual top speed of 27 knots had been a conservative estimation. Over the course of the trials the yachtrepeatedly broke the 30-knot barrier. 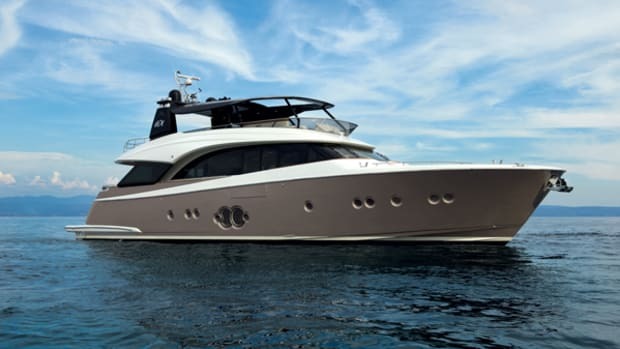 The yacht also proved quieter and more comfortable at high speed with a much smaller stern wave than a semi-displacement hull with hard chines. 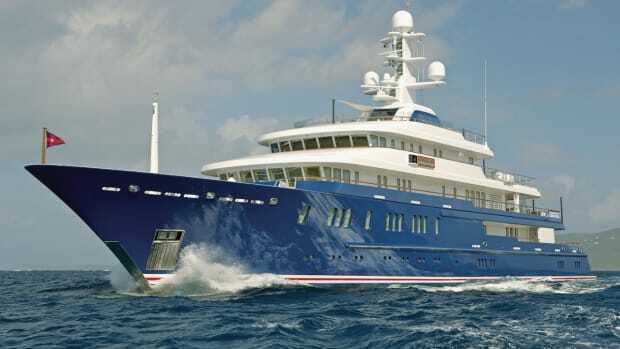 Piet van Oossanen spent 20 years working at the MARIN facility in the Netherlands, in charge of yacht research. His winged keel aboard Australia II helped win the America’s Cup for Alan Bond in 1983. 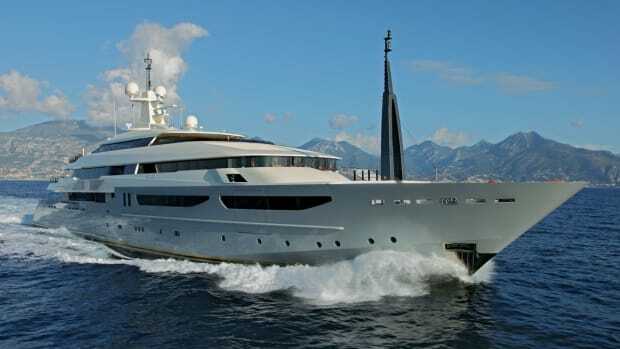 His firm of naval architects spent two years researching the FDHF concept before the idea was picked up by Heesen for its 65-meter flagship. 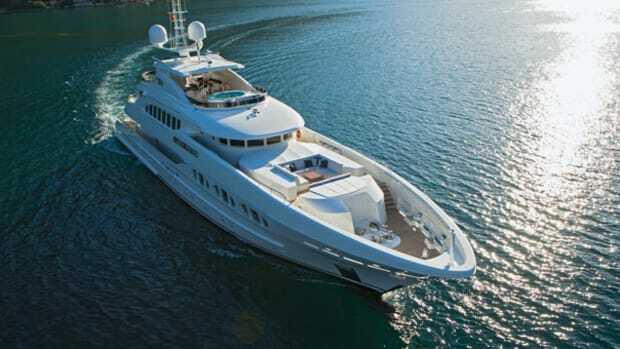 Frank Laupman worked as an in-house designer for Heesen before founding Omega Architects in 1995. 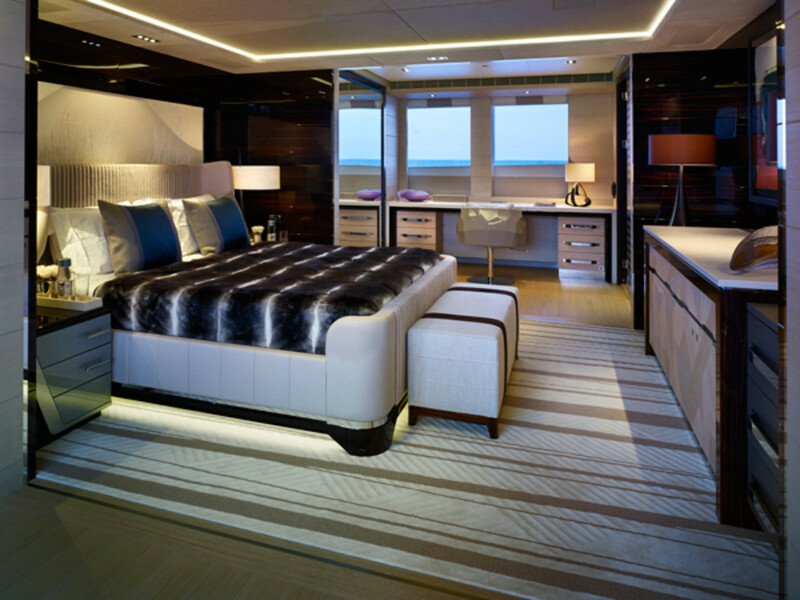 He has been intimately involved in creating most of the yachts delivered by the shipyard since. As a result, when it came to designing the exterior of Galactica Star, “the biggest design challenge was to move away from the recognized platforms, because you have to deny what has almost become a part of yourself.” A member of the Royal Institute of Dutch Architects, his work is heavily influenced by celebrated architects from the past. Dickie Bannenberg has inherited his famous father’s non-conformist—some would say iconoclastic—approach to yacht design. Following on from their distinctive interior designs for Elandess II, Aurelia and Lady Petra from Heesen Yachts, Bannenberg & Rowell introduced a similarly striking form language aboard Galactica Star.